Today’s guest post is from Professor Aaron Blaisdell and graduate student Julia Schroeder in the Department of Psychology at the University of California Los Angeles. Prof. Blaisdell’s area of research is animal learning and comparative cognition. 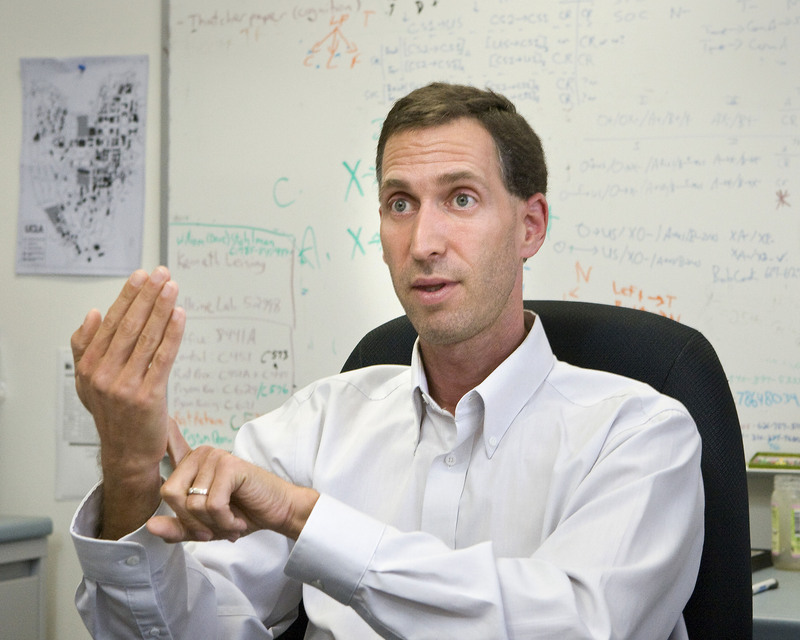 He received his Ph.D. in Experimental Psychology and Behavioral Neuroscience at Binghamton University in 1999. Julia Schroeder is a graduate student in the Psychology Department at UCLA. This project is the basis of her dissertation research which she hopes to complete by May, 2016. She received a BS in Psychology at Whitman College where she compared rational decision processes in pigeons and humans. You can support their research through their crowdfunding campaign. How do birds fly around objects without crashing into them? Their object perception must be similar to ours, despite having a dramatically different brain and separate evolutionary history. Birds and mammals share a last common ancestor roughly 275 million years ago! Nevertheless, most birds and mammals, especially primates, rely on sight to navigate their world, find mates, avoid foes and predators, seek food and water, and care for their young. Vision, both sensation and perception, has been one of the top areas of research in experimental psychology and neuroscience, going back to the visual psychophysics scientists of 19th century Germany. Visual perception and cognition is currently a dominant area of study in cognitive neuroscience. Much of what we’ve learned about human vision actually comes from research in nonhuman primates, especially the macaque monkey. This makes sense, since the human visual system is like that of just monkeys and apes. One picture that has emerged is that, when we open our eyes, we see a world populated with objects. Our object-centered view of the world is also shared with the rest of the primates. Pigeon in a test of comparative cognition. What about birds? They also navigate their world using vision. Flying puts high demands on the ability to rapidly detect and process visual information. The last thing a birds wants to do is to fly into an object because it couldn’t see it in time! This suggests that bird brains also engage in visual computational processes similar to that of the primate. But we currently don’t know much about how they do so. We want to know if birds solve the incredibly complex computational process of object perception the same way that primates do. In our next research project, we plan to test whether bird brains handle object perception the same way that the human brain does. Pigeons will play a video game where they have to rapidly peck objects as they appear on a computer touchscreen located in a Skinner box. As soon as the object is pecked, a small food reward will be delivered to the pigeon from a hopper located below the screen. The faster the pigeons peck at the object, the sooner they get fed. The speed of their responses will tell us how the birds see the objects. Specifically, we will show the pigeons four different objects, A, B, C, and D, one at a time (actual objects are different colored geometric shapes). The objects will appear in one of four locations on the screen (see a demo here). The objects will appear in a specific order that repeats. The locations in which the objects appear will also repeat. This will allow us to test how pigeons bind features into objects. If pigeons integrate features as humans and other primates have been shown to do, then they should learn that specific objects always appear in a specific location. This is called object-place learning. The object’s identity and location become bound as shared properties of a unique, coherent object. After the pigeons learn to play the game, we can then test for object-place learning by presenting special non-reinforced probe test trials. On these test trials, we will change the order of some of the objects, locations, or both. Changing only the object or location should break the object-place association. Changing both together, however, preserves the object-place association, even though the sequence order has changed. 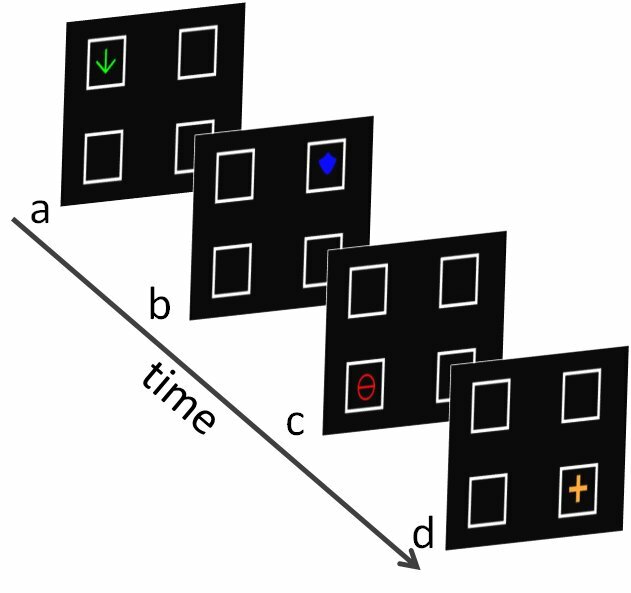 If, like humans, pigeons bind object and location information together into perceptual memory, then changing only the object or the location order should be more disruptive than changing both! What is life like for a laboratory pigeon? Like all other vertebrates in research, housing and laboratory conditions for pigeons are well regulated. All research protocols go through the same stringent processes of review by the University’s IACUC, and the health and welfare of each pigeon is overseen by the Division of Laboratory Animal veterinarian staff. They receive the best possible care. In a typical pigeon laboratory, the pigeons are maintained as part of a flock in a vivarium. Birds are typically individually housed in large, comfortable cages, with constant access to water and grit. Feeding times are typically restricted to the afternoon after all subjects have completed their behavioral training. This keeps them motivated to work for food reinforcement in the operant chamber, and maintains subjects at a healthy weight similar to that of pigeons in the wild. Despite being housed in individual cages, the birds can see, hear, and smell the birds in the surrounding cages, thereby simulating a flock as it would be found in the wild. Unlike most mammals, or even parrots, pigeons do not engage in much touching or grooming of each other. Rather, pigeons in a flock hang out in close proximity to one another. While some labs acquire wild-caught pigeons from their local area, we purchase ours from a vendor that breeds pigeons and other fowl for research purposes. Pigeons are a domesticated species, having lived in human environments since the dawn of agriculture in the Mediterranean region of Europe, Asia, and North Africa. Darwin was a known pigeon fancier, and bred pigeons as part of his own experimental investigations into the process of evolution by natural selection! To this day, there are pigeon fanciers and clubs around the world that breed pigeons for show, racing, and aerial acrobatics. Why is this research significant? The bird brain has a very different organization than the brains of humans and other mammals. Birds don’t have a visual cortex, for example. Thus, our research can lend insight into how a brain of such different structure solves the same computational process as does the mammalian brain. Also, the brain of a pigeon is the size of your thumb! So how can birds, like pigeons, see objects the way that we do with far fewer neurons than in the human or monkey brain? Knowing how birds see the world can tell us a lot about what is unique about human vision, and what we share with other species. Finally, we can also use our knowledge of how small bird brains efficiently create visual objects out of messy input to find new and powerful ways to build artificial visual systems for small mobile devices, such as drones and robots. Many neuroscientists believe object perception is one of the most important and central processes of human vision. Nevertheless, object vision has been incredibly difficult to build into robot vision using AI approaches. Perhaps we can reveal the secrets to complex object perception in the small pigeon brain that will allow for breakthroughs in computer vision. This would be a huge win for human society! Posted on August 27, 2015 August 27, 2015 by EditorPosted in Guest Post, News, Science NewsTagged Aaron Blaisdell, animal research, basic research, bird, comparative cognition, computational processing, Guest Post, Julie Schroeder, pigeon, psychology, Speaking of Your Research, ucla, vision. You raise an excellent question. There are multiple ways to respond to it. First, to compare pigeon vision to human vision typically involves comparing how pigeons perform in psychophysical tasks similar to those used to study human vision. In human psychophysics experiments, the subject typically sits in a chair facing a computer screen. They are presented with visual displays and are instructed to respond to the displays in certain ways, such as with a button press or touching the screen directly. 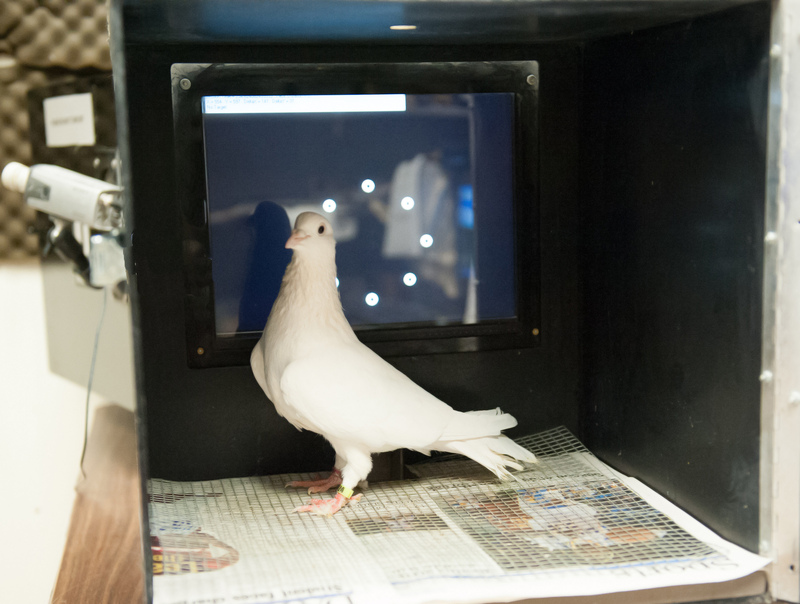 In this way, testing the pigeon on a psychophysical task where they peck at visual stimuli presented on a screen allows for comparisons across species. However, as your question implies, vision is not only used when we are stationary. It must function well while we move around the world and as the world moves around us! There is a growing body of human psychophysical research using virtual reality setups to study human vision in these dynamic conditions. There is also some work on vision in pigeons and other nonhumans (especially primates) tested under dynamic conditions. This can be achieved either by using movies on a 2D computer screen, virtual reality (easier with primates than pigeons! ), or even having the subject navigate a small space. This work is more challenging and costly given the type of equipment and procedures involved, but can illuminate many aspects of vision not captured by stationary psychophysics tasks. As an aside, another thing we must be aware of are anatomical differences in the sensory systems between species. For example, (most) humans are trichromatic, dividing the visible light spectrum into three distinct primary colors, from which the rest of the color spectrum is constructed. Pigeons and (as far as I know) all other birds are pentachromatic, dividing their visible light spectrum into 5 divisions! We can only guess as to what the color space of a pigeon looks like! This actually can create a confound when using color stimuli rendered on a color monitor because the color blending system uses the RGB system suitable for trichromats. We can’t be sure that our pentachromatic subjects see the displays in a similar way. For my research this tends to be inconsequential because we only require the birds to be able to discriminate between a set of colors, which we show that they do. Also, humans have a single fovea in each retina–where spatial resolution is highest. Pigeons, however, have two fovea in each retina. One is lower down and centrally located in the retina and is likely used for myopic view of objects (like seeds on the ground) right in front of their face (beak?). The other is higher up and more lateral on the fovea, and as far as we know is more likely used for long-range vision, to detect predators, and possibly to coordinate flight in a flock. Have you ever seen how gracefully every bird in a flock can suddenly and smoothly veer in different directions as if a single mind is controlling them? This may require input from these laterally placed fovea, but I don’t know if there’s research investigating this. You see, things are much more complex and complicated. Comparative psychology is not easy. But by carving out a well-defined research question, and systematically testing hypotheses concerning that question, we can incrementally build our knowledge of how rich is the mind of another species, and how similar and different it may be to that of a human! Thanks for the question! Can we expect the visual processing being studied on birds standing at rest to be the same as for those who are flying or “walking” where birds move their heads in jerks in contrast to humans?